(2004) "Here for the Party"
"Redneck Woman" is the a song co-written and recorded by American country music artist Gretchen Wilson. It was released in March 2004 as the lead-off single to her multi-platinum debut album Here for the Party. The song was also Wilson's only number one single on the U.S. Billboard Hot Country Singles & Tracks charts, and also earned her a No. 22 pop hit in the U.S. Wilson wrote this song with John Rich. The song, which is considered Wilson's signature song, also earned a Grammy Award for Best Female Country Vocal Performance in 2005. The song appears on the games Karaoke Revolution Country and “Country Dance”. In 2005, Jill Johnson covered the song on her album Being Who You Are. In the video, Wilson is depicted performing in a western-style club with a live band, cage girls dancing in the background, and patrons in the crowd that are drinking beer. Scenes of Wilson driving a 1973-87 General Motors pickup truck and a four-wheeler through the mud with two men are interspersed throughout the video. The music video includes the following guest stars: Big and Rich, Tanya Tucker, Hank Williams, Jr. and Kid Rock. The music video was ranked #11 on CMT's 100 Greatest Videos in 2008. The song spent five weeks at number 1 on the Hot Country Songs charts. In doing so, it became the first number 1 hit on that chart for a female solo act since "Blessed" by Martina McBride in April 2002, and the first for Epic Records Nashville since "It Must Be Love" in December 1998. In late 2004, Wilson recorded a re-written version, titled "Redbird Fever" to commemorate the St. Louis Cardinals' entering the World Series (as well as her devotion to the team). "Redbird Fever" spent one week at #60 on the country singles charts dated for the week ending November 13, 2004. In the third episode of the TV series Smash, Katharine McPhee performed the song in a karaoke bar. A contestant on the reality show Killer Karaoke sang the song while being dunked into a tank on snakes. American parody artist Cledus T. Judd released a parody of "Redneck Woman" titled "Paycheck Woman" on his 2004 album Bipolar and Proud. ↑ "Rowdy country singer Gretchen Wilson lets fans see a softer side". SJ-R.com. Retrieved 2007-08-20. ↑ Rogers, Nick (2007-08-09). "'Redneck Woman' Wilson is here for the party". SJ-R.com. Retrieved 2007-08-20. 1 2 Whitburn, Joel (2008). Hot Country Songs 1944 to 2008. Record Research, Inc. p. 471. ISBN 0-89820-177-2. ↑ "Wilson ends female drought atop country chart". Billboard. 29 May 2004. p. 72. Retrieved 28 March 2015. 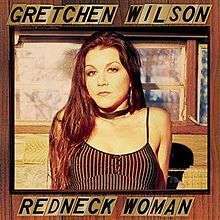 ↑ "Australian-charts.com – Gretchen Wilson – Redneck Woman". ARIA Top 50 Singles. Retrieved January 28, 2011. ↑ "Gretchen Wilson: Artist Chart History" Official Charts Company. Retrieved January 28, 2011. ↑ "Gretchen Wilson – Chart history" Billboard Hot 100 for Gretchen Wilson. Retrieved January 28, 2011. ↑ "Gretchen Wilson – Chart history" Billboard Hot Country Songs for Gretchen Wilson. Retrieved January 28, 2011. ↑ "Best of 2004: Country Songs". Billboard. Prometheus Global Media. 2004. Retrieved July 11, 2012.